Aside from its spiritual applications, The Shanghainese used to use it as normal soap as well as a shampoo. 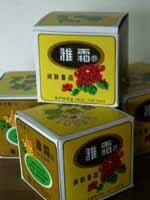 『雅霜（Ya Xuang, Elegant Cream）』was first marketed in the beginning of 1930's. 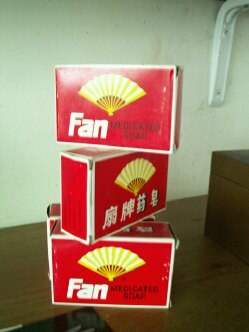 This product used to be commonly called “雪花膏（Snow Flower Cream)”and could be used as facial cream. A famous Shanghainese cinema actress, Yang Zi endorsed this product for its publicity. As it was a luxury product and had a sent of purfume, most women during the Cultural Revolution were afraid of using this cream for fear of being labeled a Bourgeoisie.